Undertaking a full office refurbishment might seem like a daunting prospect, but it doesn’t have to. Check these things off your list first and you’re half way to creating a stylish, productive workplace that enables your staff to thrive. Perhaps the most logical place to start is by considering how much you’re willing to spend on your refurbishment project. Of course, if you haven’t been involved in a project like this before, you might not have any benchmark in mind. Consider the example of buying a new car. They all have 4 wheels but can vary anywhere from £6000 to many hundreds of thousands, and they can also have very different functions. how should you decide on a budget? Office refurbishments are no different to any other capital project in that there are often countless possibilities of what you can achieve. Deciding what is affordable for your organisation makes it much easier for office design companies like us to give you a relatively accurate idea of what you’ll be able to attain within your financial means. For example, a bigger budget could allow for construction work to completely change the layout of a space, whilst a smaller budget may require a different approach to the transformation. It also depends if you are fitting out a new space or refurbishing in-situ. 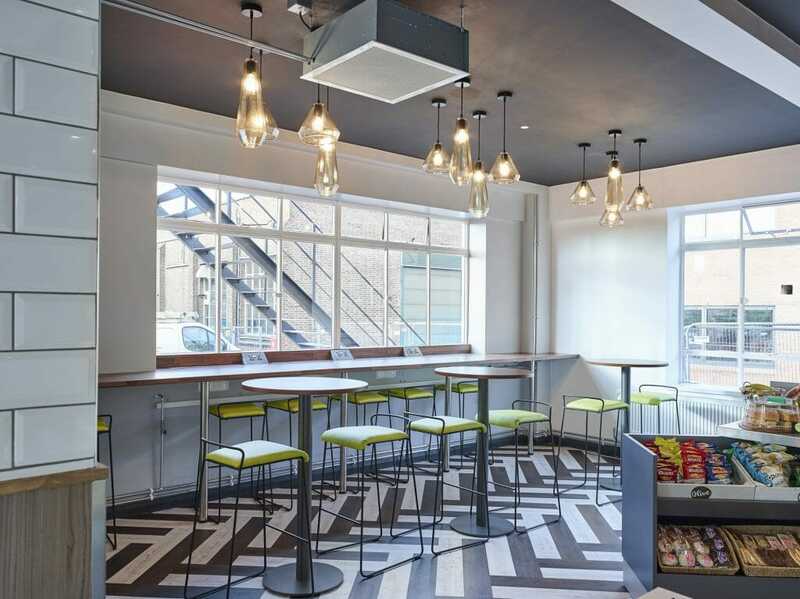 We made clever use of a small space to provide a fully-fitted kitchen area at CoStar Group’s Birmingham offices. As a rough rule of thumb, a comprehensive refurbishment project which includes a reception, a variety of meeting rooms, a café/tea point, new furniture, new air conditioning etc. could range from £40-£70 per square foot. So a typical 5,000 sq foot office might require a budget of £200-£350K. Your workspace should facilitate the way your business works. Refurbishing your space gives you the exciting opportunity to ‘start again’ with your office design to reflect the constant evolution of your people, systems and ambitions. Take a step back to reflect on how your business operates now. At the same time, consider your ideal ways of working. Do you operate in a certain way because your current space dictates it? Would you continue in the same way if you had the opportunity to do things differently? how do I know what my businesses’ ideal working styles are? It can sometimes be difficult to look at these issues from an objective perspective, so a Workplace Assessment is a fantastic place to start. This process is effectively a fact-finding mission with the aim of gaining a comprehensive understanding of your business in order to determine what the ideal working environment might look like for you and your staff. 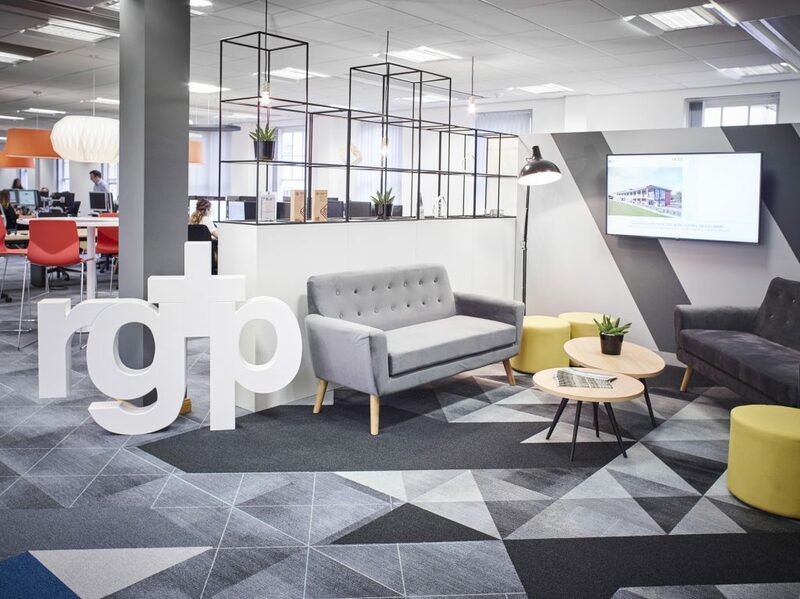 You can see in our project with rg+p Architects how their aims and desired working styles directly influenced the design of their new office. 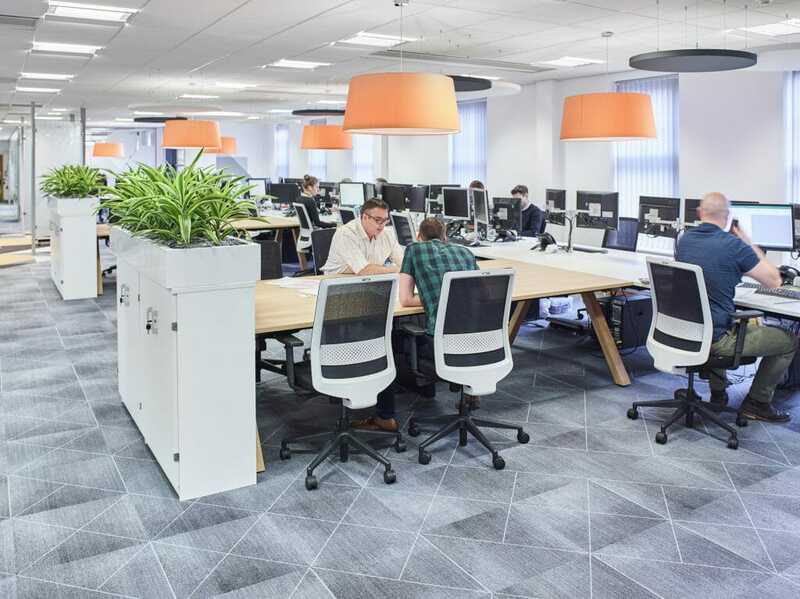 The main goal for the refurbishment was to create a space that facilitated collaborative working across the company’s project teams. For them, this meant having flexible working environments throughout their space providing the appropriate desk space, access to technology, meeting areas and storage facilities. Collaborative workspaces at rg+p Architects offices. Taking environmental factors into account when planning your refurbishment can help to eradicate many common issues found in the modern office. A noisy space, or an office that echoes can be quietened using clever acoustic solutions, and a dark office can be enhanced with appropriate lighting or elements throughout the décor, for instance. Simply recognising the limitations or advantages of the environment you are operating within is an integral part of the process when creating your optimum workspace. 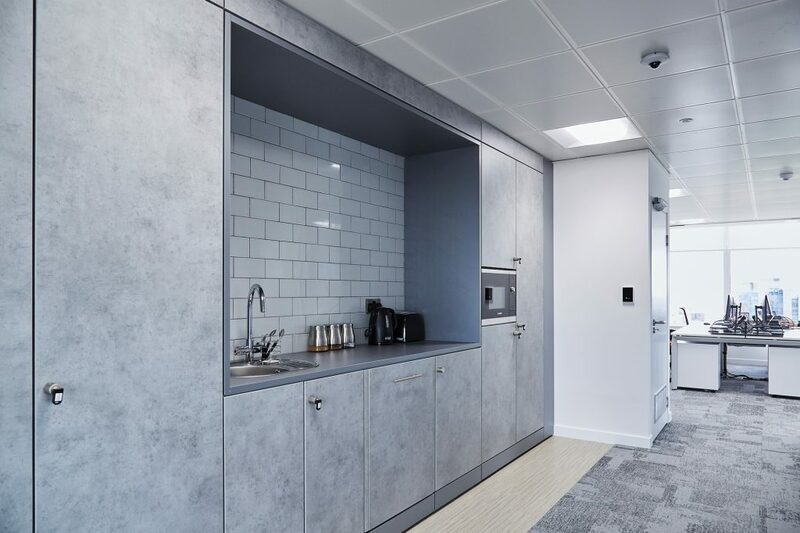 The remodelling of the Clinigen headquarters involved identifying how their current working environment could be transformed through a detailed accommodation study. The result involved the implementation of clever acoustic solutions, company branding, appropriate lighting and biophilic planting to transform their office buildings into a collection of light, bright, comfortable work and social spaces for their staff. 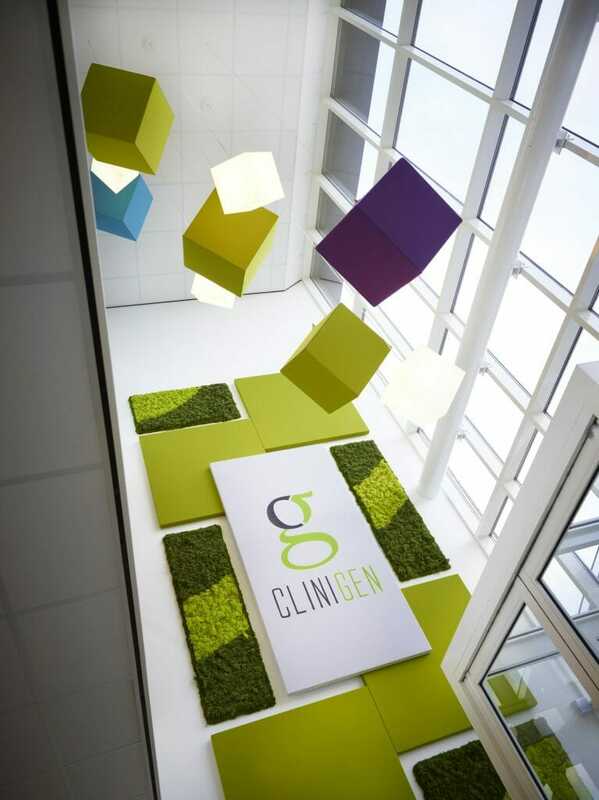 An example of moss walls, acoustic panels, lighting and branding used at Clinigen Global headquarters. Expectations for technology in the workplace are high, and so they should be. Whatever industry you’re in, having the appropriate technology needed to operate as efficiently as possible is essential if you are to stay ahead of your competitors. If there are obvious problems, it’s worthwhile talking to our technology specialists to discuss how to solve them. Even if you are content with the way things are working, it still helps to do some research on what’s out there to determine whether an investment in some updated technology could mean advances in efficiency or increases in income for your business. 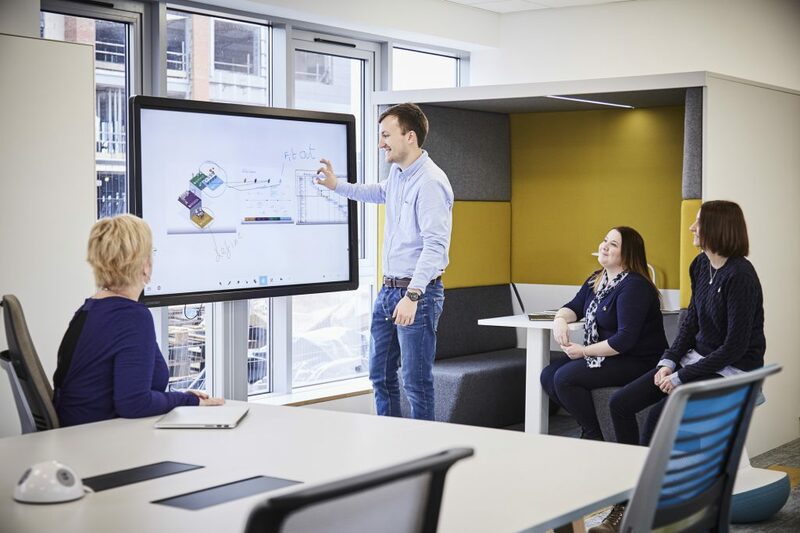 We’ve integrated technology throughout our offices at WorkLife Central to allow you to experience the latest in workplace technology for yourself, and understand how it could enhance your own organisation’s efficiency. You can book a visit here. CleverTouch screens, just one of the examples of workplace technology at WorkLife Central. The positive impacts of choosing the right furniture for your workspace may not be immediately obvious, but the benefits can be huge. Yes, it is important that your furniture is aesthetically pleasing, but there is so much more to be considered here. There are unprecedented productivity gains to be had by ensuring your staff are comfortable at work, and this doesn’t just mean having the right chair or desk. It incorporates the furniture used in the break area, or the amount of storage each person is allocated. Having thought about your ideal working styles and the needs of your staff, you can start to visualise alternative ways of working – acknowledging that, for many people, working at a traditional desk is not the only answer. A significant proportion of your people will be engaged in project-based work rather than a traditional continuous process. New ways of working have to allow for members of the team changing during the lifetime of the project – including perhaps external workers. Likewise, their needs for collaborative tools will vary. Meeting spaces are frequently the most misunderstood and badly implemented example. How many meetings are really confidential and require a sound proof room? Most meetings just need visual and acoustic privacy which can be achieved in many different ways. Using furniture to create these spaces not only reduces infrastructure disruption and cost but also creates much more flexible spaces. How often have you seen (or been part of) a meeting with 2 or 3 people in a room designed to seat 8 or 12? 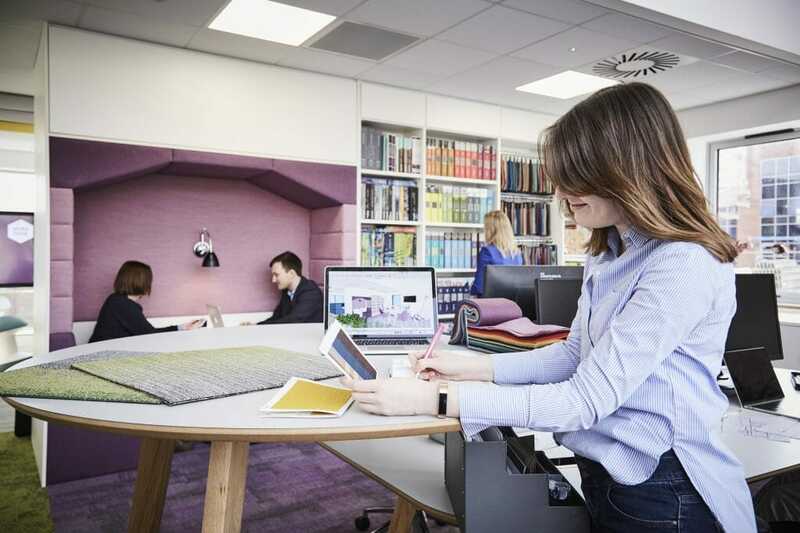 A visit to WorkLife Central will allow you to see a variety of options for creating your own technology-enabled, private and flexible meeting spaces. Small meeting room at WorkLife Central, tech-enabled and acoustically optimised. 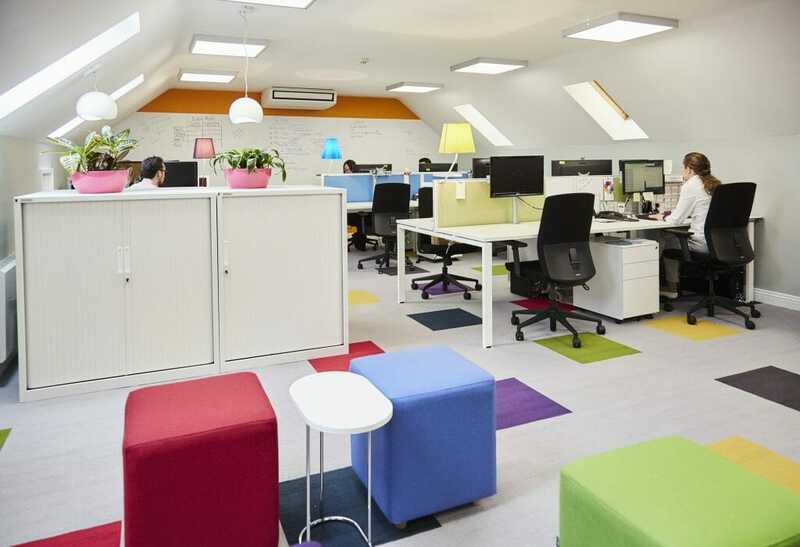 If you have decided to refurbish your current office space because it is becoming crowded, it would be wise to consider how much further you are planning to expand before deciding on a refurbishment as the best way forward. If you are looking to grow your staff numbers in the near future, will your existing space cope with your plans for expansion without encroaching on your current employees’ space? It may be that a redesign will allow you to use the space that you already have more efficiently, but there is only so much a workplace can take before becoming overcrowded and unfit for purpose. It’s at this stage that the decision should be made whether to stay put or move on to new, more suitable premises. It’s not always necessary to relocate in order to achieve the perfect office space to suit the way your business works. Assessing if and how your current space could be utilised further to achieve maximum potential is a worthwhile exercise. 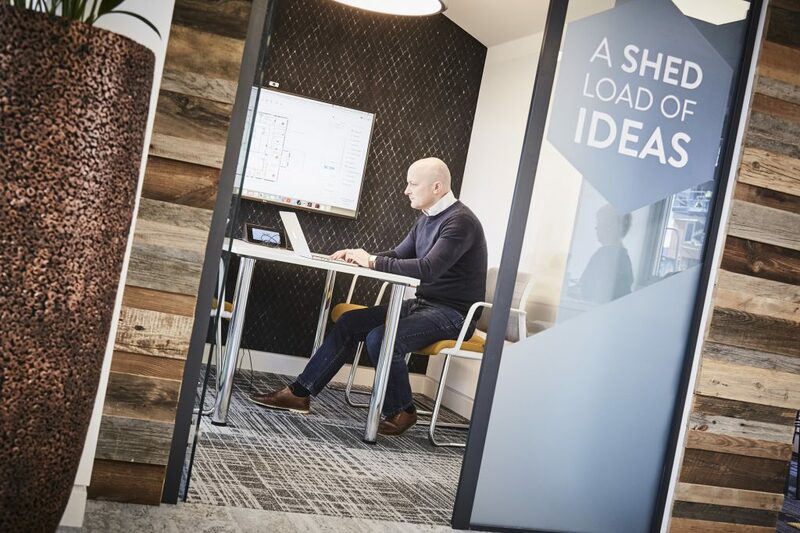 Our office design experts are well-versed in recognising the merits of a space that isn’t being used in the most efficient way, and can discuss your available options with you. 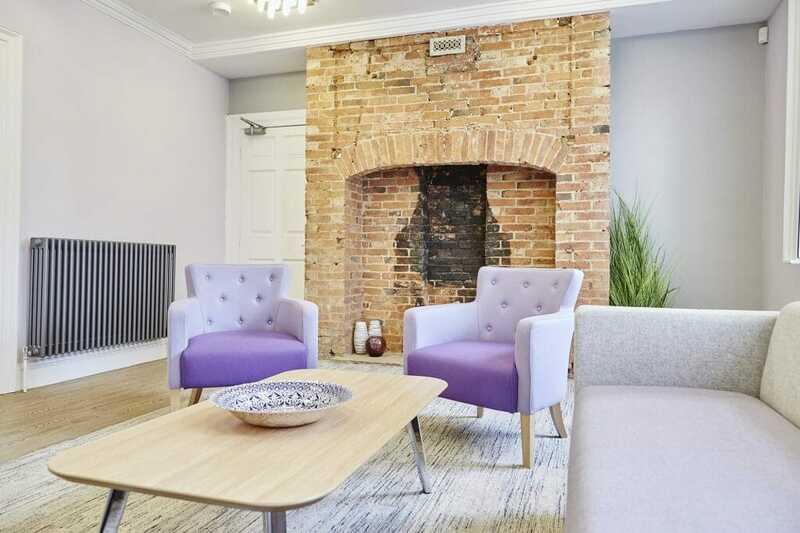 The project we completed at Rainbows Children’s Hospice offices involved transforming what was a collection of small individual offices into a bright, open plan office to facilitate the charity’s ability to carry out their life-changing work with enhanced collaboration. Rainbows: The new open plan space incorporating a range of flexible, open and private workspaces. It would be an ideal world if restrictions weren’t a factor on our office refurbishment checklist, but we have yet to come across a project without any at all. Your building may pose mechanical, electrical, or listed building restrictions for example, but these factors don’t have to stop you from achieving what you set out to. What types of restrictions could a project have? Restrictions could affect when works can be carried out, how certain elements are introduced into a space, or the solutions that are used throughout the space. For example, if a building is occupied by other tenants it may be that deliveries or works can only be completed out of hours. This might add cost or time to the project. The architecture could restrict the solutions that are available for a refurbishment – access could be difficult, and the internal architecture may also dictate how the space can be used due to the way that power or data can be supplied to certain areas. If your space has a concrete thermal mass ceiling it would need to remain exposed, restricting the ability to add a suspended ceiling, thus influencing how lighting and services can be delivered in the space. The additional hard surface would also mean that the acoustics will need to be addressed. These examples may sound problematic at first glance, but restrictions are something we always discuss with our clients so that we can work with you to consider appropriate solutions, whatever your situation may be. So don’t allow restrictions to scupper your plans for creating an inspiring new office! The result of the office refurbishment we completed at DB Wood. As a design-led organisation we understand the importance of good design in the creation of an ideal working environment. Even if you are not a customer-facing entity, it’s just as important that your staff are invested in your brand and what it stands for, and your office design is essential in fostering this. A good office design can enhance your staff’s motivation to succeed and create value in your business, with the pay-off being increased productivity and effectiveness. In fact, consider the alternative – a workplace that hasn’t been designed at all. Many people are working in such environments where changes in the workplace have been made as a response to growth rather than having been planned. Such spaces are usually characterised by inconsistent planning and purchases. Your ideal office design doesn’t have to cost the earth. But not having a design is the same as not having a plan, and we all know the consequences of a lack of planning. Design is an investment and our work will allow you to make an informed decision on your office design. It will enable you to understand what you’re buying, why it looks like it does and why it costs what it does. With our help, you will be in control of deciding where to invest to maximise the value to your business. The central theme running though all of these factors is workplace wellbeing. And if you haven’t updated your workspace for a while, it could be impacting on the wellbeing of your staff. There are many simple things that you can think about incorporating when refurbishing your workplace to promote a healthy and happy workforce. Of course, it all comes down to the fundamentals of how your business works as to how happy your staff are. But showing your employees that you have taken their wants and needs into consideration when refurbishing their office space will go a long way to creating the perfect environment where your business can thrive. One area of the work cafe in the social hub we designed and delivered at MIRA Technology Park. Considering an office refurbishment of your own?